Live Longer with Cleaner Air - Sentry Air Systems, Inc.
Sentry Air Systems, Inc., a manufacturer of industrial air cleaners, knows the serious ramifications that can result from working in an environment where smoke, chemicals fumes, particulates, and other toxins litter the air in one’s workspace. Studies have shown repeatedly the deadly results that can occur to those breathing toxins on a daily basis, such toxins as asbestos, formaldehyde, acetone, acidic fumes, lead particulates, and pharmaceutical compounds to name a few, not to mention cigarette smoke. Sentry Air Systems addresses these issues with companies every day. 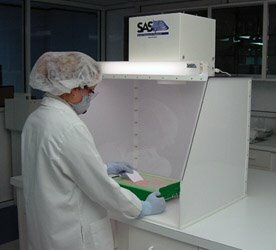 A laboratory operator is protected with a Sentry Air Systems SS-330-DCH (30″ wide ductless containment hood) during a chemical powder application. Bryan Rossnagel, president of Sentry Air Systems says, “Industrial air cleaners have played a significant role in protecting worker’s health. However, careful evaluation of the type of fume extractor you need is required. You must be sure that your needs have been matched with not only the right kind of fume extraction system but the appropriate filtration media, as well. Members of our sales team have chemical, biological and engineering backgrounds and can work with companies to find solutions to their air quality needs.” Sentry Air Systems offers a wide range of filters designed to capture different kinds of toxins and particulates. Some of the filters they offer include high-efficiency HEPA, heavy-duty activated carbon, Merv11, ULPA, ASHRAE, and Mist filtration. The scope of businesses that Sentry Air Systems works with ranges from small home-owned businesses, to the government, to large Fortune 500 corporations. The applications these companies engage in are as vast in the spectrum as the number of companies Sentry Air Systems serves. Just a few of the applications Sentry services include welding fume extraction, pharmaceutical compounding, soldering, chemical fumes, spray paint/glue/electronic coating, and many more.